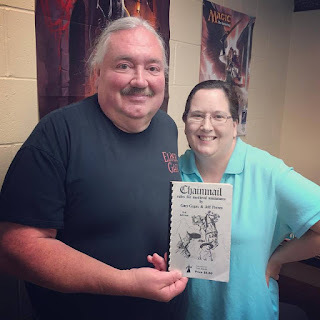 Over on merricb.com, as part of his Meric's Musing reviews, Merric Blackman gives us a look and his impressions of "The latest set of WizKids Icons of the Realms miniatures for D&D" here. Always a treat to read his thought on pre-painted plastic minis as he's been at this quite a long time. Also, on the All Natural Arts Facebook page (also has a website here), sculptor Sue Beatrice mentioned some tiny weapons she was preparing for a custom order. 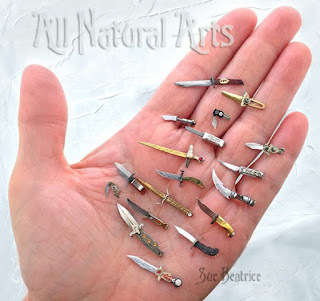 She said, "These 18 tiny knives and swords were created using antique and vintage watch parts. The red gems you see are watch rubies. These will all go into a custom piece belonging to a young knife collector on his 18th birthday. Each blade was honed to a sharp edge (can you find the little slice one made on my palm?)" She also mention that she would unveil that project on Monday, April 25th on the Facebook page here. Finally, on the Teri Litorco YouTube channel, she has an nifty video showing an "Easy X-Wing Repaint Tutorial: Poe Dameron's T-70." Of the various Star Wars games that have come out lately, including Armada, X-Wing, and most recently, Rebellion, I've enjoyed them all but X-Wing definitely seems to be that one that crops up on convention and gameday schedules for tourneys. Enjoy!